Heath got a package from his Grandma. Look how happy he is with that can of peaches! Hello friends, I know it has been awhile. I have been traveling all around Mongolia for the last 3 weeks and I finally am in a place with reliable internet. I am in Sukhbaatar, which is in the SE part of Mongolia. As I type, I am sitting in Heath’s ger, listening to the pitter-patter of rain hitting the felt roof. There is light shining in through the circular window above my head and the occasional raindrop hits my thigh due to the chimney hole. The ger is surprisingly spacious and I must say, it is very cozy. I’m actually typing in an armchair, Heath is napping/reading in his bed, and there is at least 15-20 feet between me and the opposite wall. Heath’s ger is covered with decorations from home and he has carabiners all over the place holding kitchen stuff and clothes. I’ll just mention that the ger is the typical Mongolian home (but apartments are becoming widely used now, especially in the city). There are ger neighborhoods, where people live in khashaas (Hashaa means fence), and inside these fences are 1-2 gers, a shed, an outhouse, and other necessities. I’ve heard that it only takes an hour (maybe even less time) to set up a ger, which is why they are handy for nomadic Mongolians. It is very easy to pack up your ger and house items, place them on a camels/horses/elks backs, and then migrate to your next destination. In the city there are ger districts, but in the countryside, there is just space and if you like someplace, you just plop your stuff down and claim it till you leave again. After traveling here for 2 months, this kind of lifestyle starts to make so much sense. Why doesn’t the US do this?! Well, I’m sure some of you are wondering what I have been doing for the last 3 weeks. Well, I’ll start with my first destination: Erdenet. So, I met my friend Heath in UB. He traveled all the way from Dariganga, which takes about 20-24 hours (split into two days). It was surreal seeing him again. The last time I had seen him was about 1.5 years ago at his goodbye dinner in Eugene, Oregon. I remember hugging him and saying “I’ll see you in Mongolia.” It’s wild that I actually made it to Mongolia and that I’m with him now. The next day, we caught the afternoon bus and spent 7 hours catching up on our lives. There was one stop where we got some sutetse (which is Mongolian milk tea) and cookies. Mmmm… cookies. It was surprising how easy it was to talk with Heath, it was like we were in college again. So, we made it to Erdenet in good time and had a Peace Core Volunteer (PCV) welcoming party, which consisted of Kevin, Sarah, and Brittany. Kevin would be our host for the next few days. They made us dinner and I spent a majority of the night getting to know them and listening to them talk about PCV stuff. I got to know Kevin pretty well and he is a hoot. He is a 42 year old athletic trainer, who decided to drop everything to do Peace Core. He’s the healthiest 42 year old I have ever met. Sarah is a sweetheart from Kansas and Brittany is a spunky girl from South Carolina. Quite the trio. 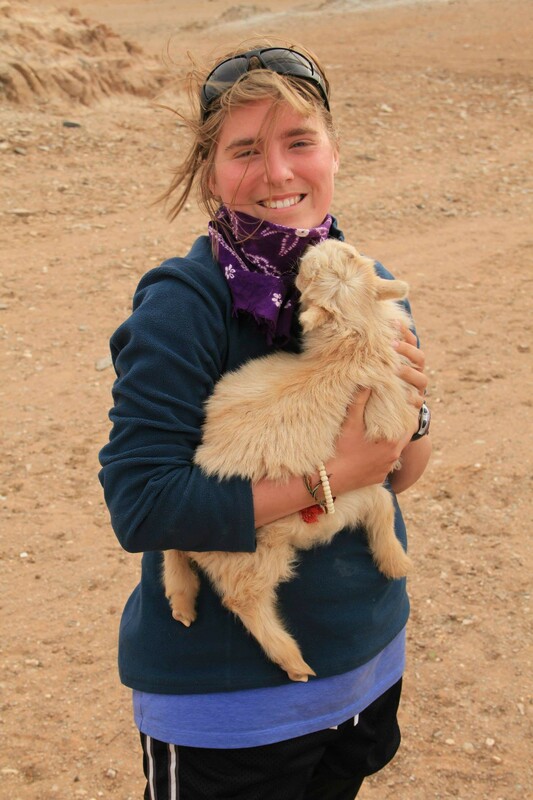 Honestly, most of the time spent in Erdenet was spent resting, catching up with Heath, eating food, and spending time with my new PCV friends. But, here are some of the highlights. Another highlight was eating hosher, which is a large fried wonton. 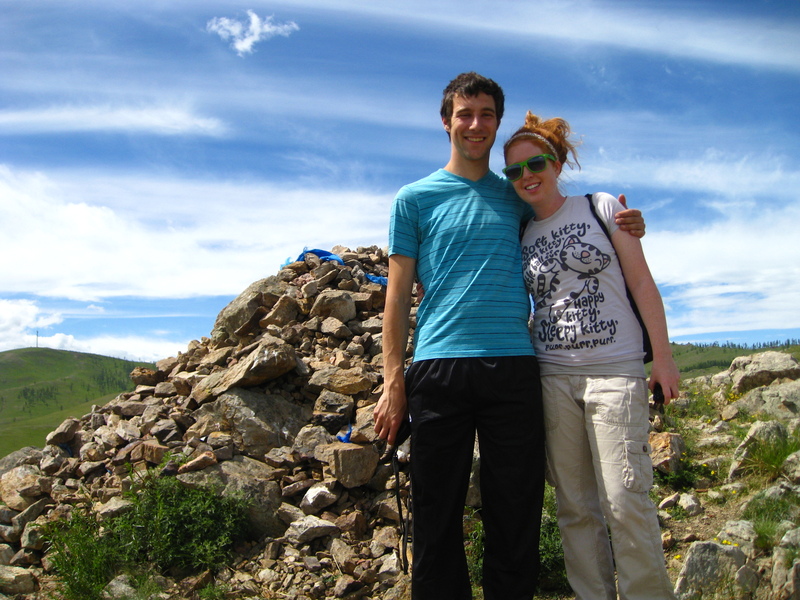 Another PCV, Nathan, who is married to a Mongolian woman invited people over to get rid of his stuff. He has finished his 2 years of service, so his wife was using up the rest of their meat and veggies, and made delicious, but terrible for you hosher. We also played Yahtzee that night. I hadn’t played that game since I was a little girl. The best part though? It was my first time being in a room full of Americans since… well… America. It was nice talking fluent English and being understood with a group of people. (Oh and if you were wondering, I did terribly at Yahtzee). The following day, Heath and I went on a hike to the nearby Golden Buddha. 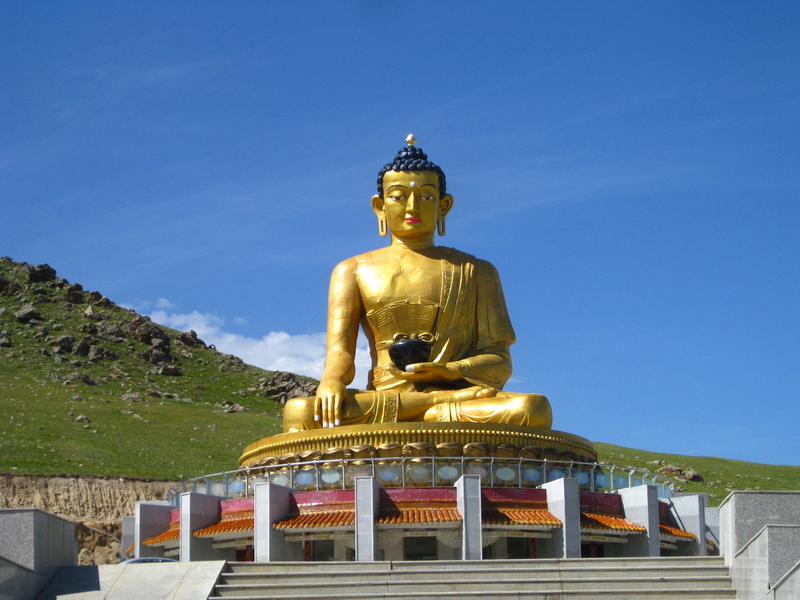 It is the largest Golden Buddha in Mongolia. 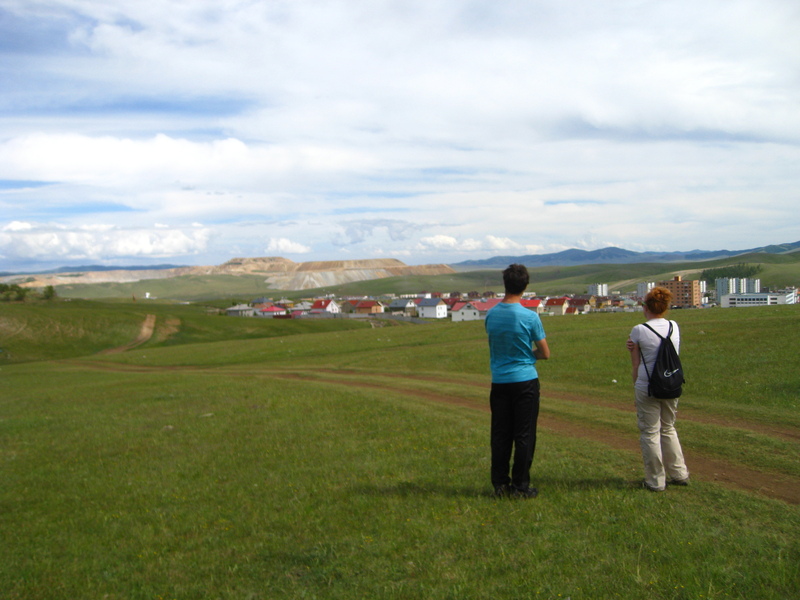 While hiking up to it we were bombarded by cute Mongolian children who wanted to practice their English. We sat with them for a short while asking them their names and asking them their favorite colors. It was adorable. This was also the first time I got a glimpse of the copper mine and it was HUGE! I was told it is the 3rd largest copper mine in the world. It looks like a mountain in the distance, but the mountain is only the pile of dirt that they dig out and place to the side of the hole. Holy Mother of Pearl, right? I sadly never got to go to the hole, but I was told that it is massive. We went hiking again with Sarah another day and went up a hill to get a good view of the mine and of the city. 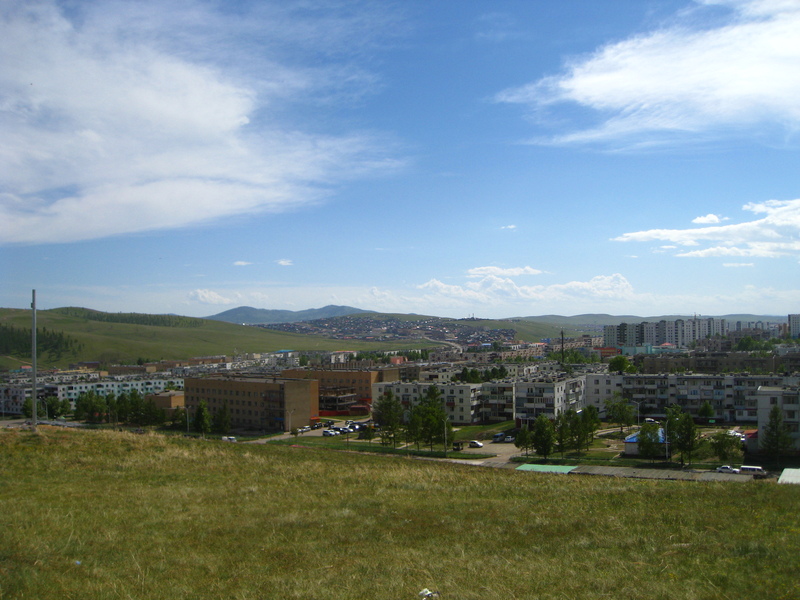 From the hill, I could really see the big differences between Erdenet and UB. Erdenet has more trees, less traffic, and clean air. Even though Erdenet is the 2nd biggest city in Mongolia, you wouldn’t think it. It doesn’t really look/feel that big. We hiked along the edge of town through the grass fields and had good conversation. The weather was perfect and the company was superb. Lucky me. Heath and Sarah beside an ovoo. This is where you walk around the rocks 3 times and then you throw 3 rocks in one at a time. 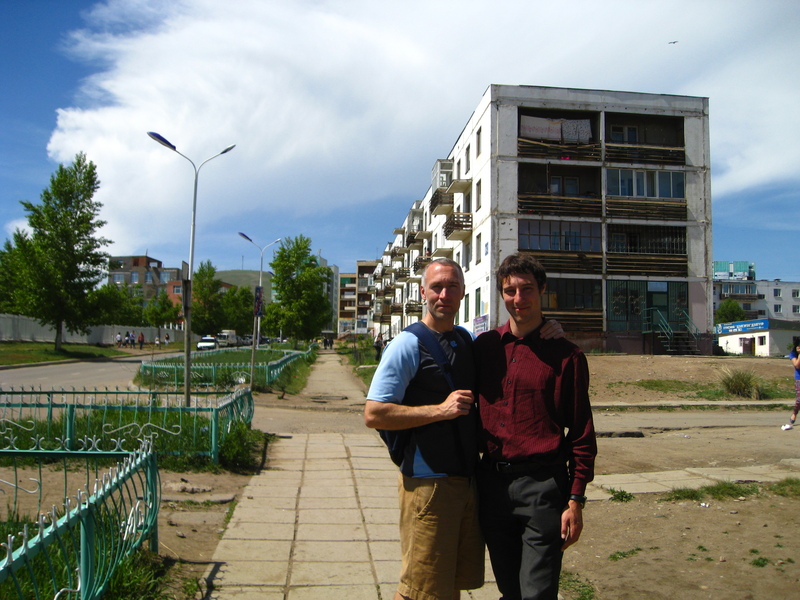 Ovoos are found all over Mongolia, especially in sacred places. Here is the best shot I got of Erdenet. There is more city to the right and you can see the ger district in the distance. That evening, we met up with the PCVs and watched a local soccer game. The mine has thousands of workers and a way the mine keeps attitudes up is by hosting soccer teams. So, Gracie’s boyfriend, Tulga, is part of a team and we cheered him on. After the game, we putzed around with a soccer ball. Heath, back in his prime, was the captain of his soccer team. He was also the goalie, so we all tried to shoot some goals against him. It felt good to get my heart pumping! It also reminded me that I am terrible at soccer and need to improve. 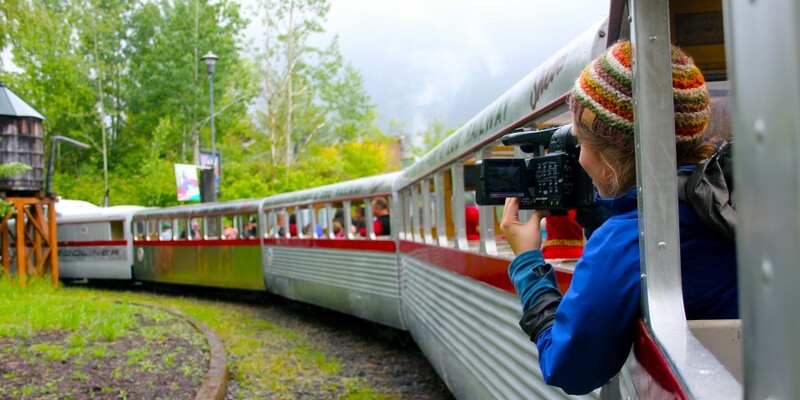 At the end of our stay, we tried to catch the night train back to UB, but the train filled up. So, we found 2 other people to split a taxi ride. Our taxi was not too reliable though. The lights were not working and we had to stop multiple times to figure what circuit was out. There was a time when I had the best flashlight, so it was me with the flashlight and 3 Mongolian men working under the hood. It makes me laugh remembering it. To be honest, I wouldn’t of wanted our long car ride back any other way. It was quite the adventure being stuck in the middle of Mongolia in the middle of the night. I mean, the whole situation felt so…. well, Mongolia. While watching the 3 Mongolian men work on the hood, all I could do was smile and look at the stunning stars above me. Heath and I had some good laughs and conversations during the whole debacle. Now, that is a memory I’ll keep in my back pocket. Well, Heath and I are going to cook some chili. His grandma sent him a package and inside was a packet of chili spice. Hooray! Heath and Sarah looking to the copper mine. I wasn’t kidding, that mine is huge!!! The clouds look for pretty!! What a beautiful place…I love how you write Molly. It’s like you are talking to me. Thanks to Sarah and Kevin for making movie night all weeks :D i visit all the time. Oh, wow! Aren’t they good people? I miss them. I’m glad there is still a good community in Erdenet.